Reversible pattern. Provides comfort and warmth. Use as gloves or glove liners. Color coded hem to identify sizes. Non-coated styles are made with FDA approved materials for use in food processing applications. Style: Work; Wrist Style: Knit; Material(s): Cotton; Polyester; Color(s): Gray. String Knit Gloves from Memphis Glove! 4057 In Stock today. 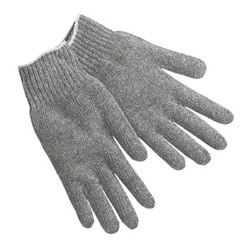 These fit in gloves or mittens for layering. They work in cold for assembling small parts without loosing dexterity.